Even before the start of the Test series, team India is struck with a bad news. The opener Prithvi Shaw has been ruled of the Adelaide Test against Australia. In the practice match against Cricket Australia XI, he twisted his left ankle that led to his ruling out. He was fielding at deep mid-wicket during the game. Off Ravichandran Ashwin’s bowling, Max Bryant danced down the wicket and lofted the ball towards Shaw on the boundary. The teenager caught the ball but twisted his left ankle in the process. He fell outside the boundary line with the ball and looked in excruciating pain. 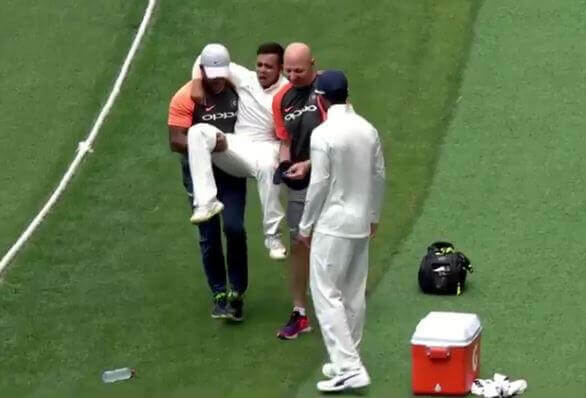 India’s physio Patrick Farhart rushed towards Shaw immediately. He was unable to put any pressure on the left leg. As a result, he had to be carried off the field. He was taken for scans quickly which revealed that the 19-year-old has suffered a lateral ligament injury. The youngster would now go through an intensive rehabilitation program so that he is available for the remainder of the series. Shaw had hit a brilliant 66 in the same practice match a day before. He was a certainty for one of the opener’s slots for the Test series. There would have been a tussle between KL Rahul and Murali Vijay to be his opening pair. Now Vijay and Rahul will open the innings in the Adelaide Test. Team India hasn’t announced a replacement for Shaw yet which means they are hoping for him to recover soon. Rahul hasn’t been in the best of forms of late. On the other hand, Vijay is making a comeback after being dropped midway through the England tour. The duo now has a chance to prove their worth once more.